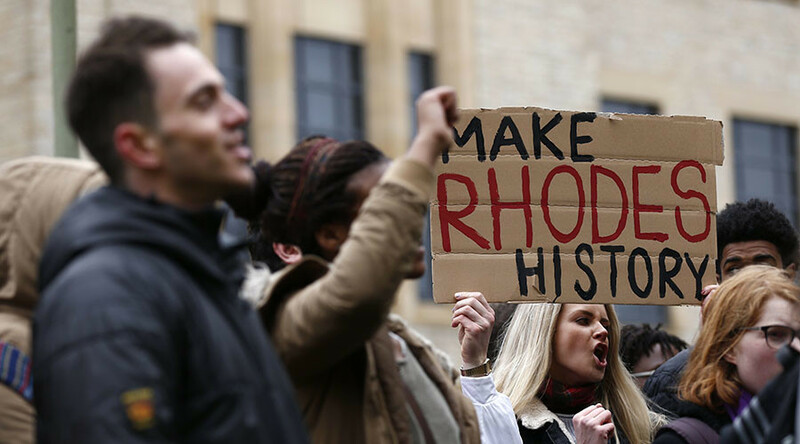 To mark one year since the ‘Rhodes Must Fall’ campaign was launched, Oxford students offered an alternative sightseeing tour of the city by staging a march and ‘die-in’ protest outside landmarks linked to Britain’s colonial past. The campaign was founded to demand the removal of Oxford University’s statue of Cecil Rhodes, a controversial figure who supported racist measures against black Africans during the colonial era. The protest is in solidarity with the founding movement in Cape Town, South Africa, which defaced a Rhodes statue a year ago. It was eventually pulled down in April 2015. Protesters marched to sites including All Souls College’s Codrington Library, named after plantation and slave owner Christopher Codrington, and Rhodes House where the benefactor dedicated scholarships in his will. Oriel College, where the monument remains, had previously backed down over calls to remove the statue after prominent donors threatened to withdraw funding from the institution. In January, university chancellor Chris Patten refused to buckle in the face of pressure, just days before the Oxford Union voted in favour of removing the statue. There has yet to be a definitive outcome as the vote was non-binding. “Our history is not a blank page on which we can write our own version of what it should have been, according to our contemporary views and prejudices,” he said in a speech. Ntokozo Qwabe, Oxford student and co-founder of the movement, previously accused the university of “violating” its own policies with the “glorification” of such figures. “The open glorification of racist murderous colonialists in academic spaces is offensive and violent to students who are descendants of those who suffered at the crimes of these colonialists, and violates the university's own policies on equality an inclusiveness, and the need to treat all students with due human dignity,” he wrote in a Facebook post.